On the 31st of March, the Vodacom Blue Bulls take on the DHL Stormers at Loftus Versfeld, and with your help, we are going to try and fill up the stadium in order to bring some relief to drought-stricken Cape Town. Will YOU be there? #DayZero, the day when Cape Town’s taps will officially run dry, has been moved out once again to 9 July 2018. This, however, is no cause for celebration, as it only buys the City of Cape Town another month to prepare for the real threat of no clean running water being available. Dams around the city currently have collective water storage of only 24.4% and Cape Town residents are still urged to use less than 50 litres of water per person per day. In other words, just one toilet flush uses 9 litres of water, a 90 second on-off shower uses 14 litres of water, the same as one load of laundry. It is no myth that responsible water habits will have to become the norm, not only for Capetonians, but for all South Africans. We’ve asked you for suggestions on what we should do and who we need to help. You said sustainable, meaningful, and cost-effective assistance to vulnerable people, who do not have the means 'to make a plan'. 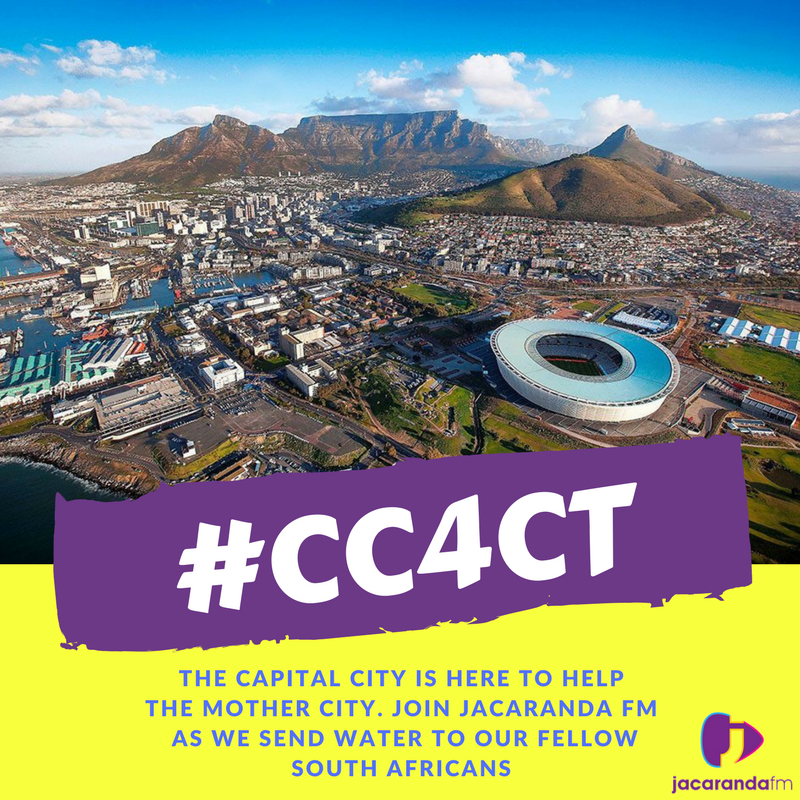 We also asked the Cape Town Water Crisis Committee how we can assist - and today we can reveal the plan. Together with our Jacaranda FM listeners, we want to fill up Loftus on 31 March, when the Vodacom Bulls take on the DHL Stormers, to raise funds to help vulnerable Western Cape schools. Help us fill-up Loftus to do our bit to help the Western Cape schools become water sustainable. According to the Western Cape Education Department, the only reason why schools would have to close due to the drought is if they cannot supply ablution facilities to learners: no toilets, no school. Regardless of when or if Day Zero actually becomes a reality, the Western Cape Education Department is embarking on a process of taking all school ablution facilities off the municipal water grid by reticulation of grey-water. The Department is funding water container tanks at all 1500 affected schools – but they do not have the funds to drill boreholes or wells. They’ve identified 80 smaller, rural schools, with less than 300 learners, where wells will be sufficient to run the school’s ablution facilities with pumped water, rather than water from the municipal water system. Wells are not as deep as boreholes and therefore cost less to drill. We want to fund the drilling of wells, fitted with solar powered pumps, to ensure a cost effective ablution solution. Breakfast Show hosts Martin Bester and Tumi Morake spoke to Patty Atwell, who is the Director of Communications for the Western Cape about why schools should be the focus right now. Many of you have already shared your support and have made it clear that you will be at Loftus at the end of March.